Info "Hit the UFO with the rocket to save the world!" Welcome Committee is a Microgame in WarioWare: Smooth Moves. It is in Mona's stage. 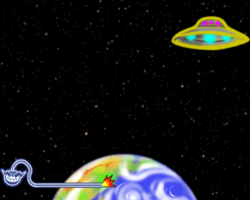 The player must use the Wii Remote to control the spaceship and destroy the alien UFO. At more difficult levels the UFO strikes back. 1st level difficulty: The UFO stands still. 2nd level difficulty: The UFO moves. 3rd level difficulty: The UFO is smaller and controlled by a small alien who shoots round balls to attack and possibly destroy the missile. This page was last edited on February 19, 2018, at 16:30.